Look What I Keep In My Mama-Car-Pack! …What’s in Yours? 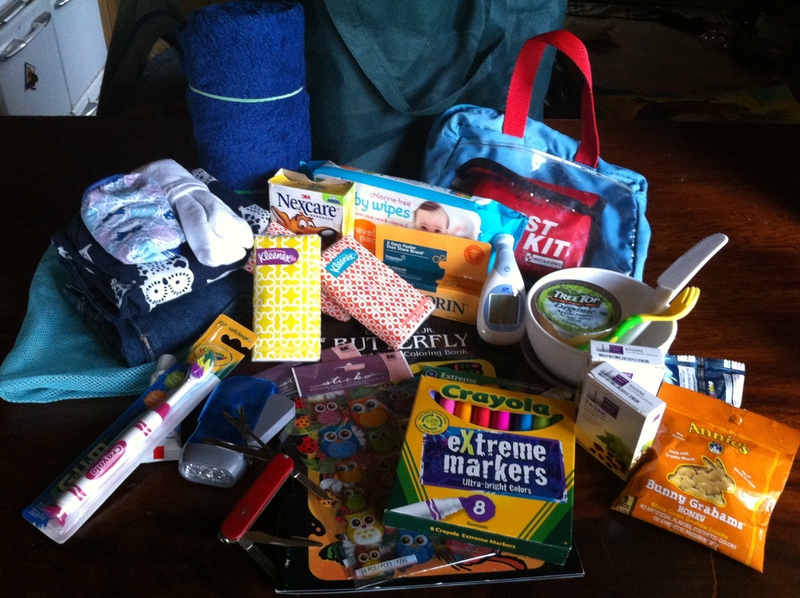 From safety kit & spare toothbrush to change o’ clothes & coloring book, it may look like a heap, but it fits neatly into a little bag! It was a vomit explosion! Yes, we were bumping down the road and, with no warning, my little girl went “braaahhhh” all over herself, the seat, the floor… well, you get the idea. Poor thing. She was okay, be we still had about 40 minutes of driving left and a big mess to clean up. I was never so grateful for my mom’s car-pack than at that moment. I was able to give her a piece of ginger gum, wipe her down and get her into clean clothes. I also had a towel and the wipes came in handy as well. All the messy stuff went into the plastic bag, she had some water and we were on our way. I want to share what I keep in my personal “Mom-Car-Pack”. It has changed over the years, as she has grown, and this is what we feel we need to get down the road with a 5 year old. Any parents out there who care to share what they find useful for their pack, please write in here as we would love to hear new ideas! Here are our essentials, which pack nicely into one of those thin “book bags” that we often get at events, but don’t really have a use for! 1. Safety kit including: Scooby Doo bandaids, neosporin, thermometer, Arnica cream, sunscreen stick, nail clippers, tweezers, Hyland’s bumps ‘n bruises ointment, ginger gum (for upset tummies), spare toothbrush & travel toothpaste. 2. Change of clothes, including undies, socks, pants, t-shirt & sweater. 3. Towel, rolled up tightly and secured with 2 rubber bands (never know when you’ll need a rubber band!). 5. Activities (In case of car trouble, or other delay): Brand new coloring book, 2 packs of stickers, small packs of crayons & markers. 6. 4 travel tissue packs. I drive a Volvo so my little bag fits right in behind the seat. I should note that if you live in a hot climate (like California!) you should be careful about storing food, creams and other heat-sensitive items. I never keep water in plastic bottles in the car because of heat and just bring it fresh when I head out the door. 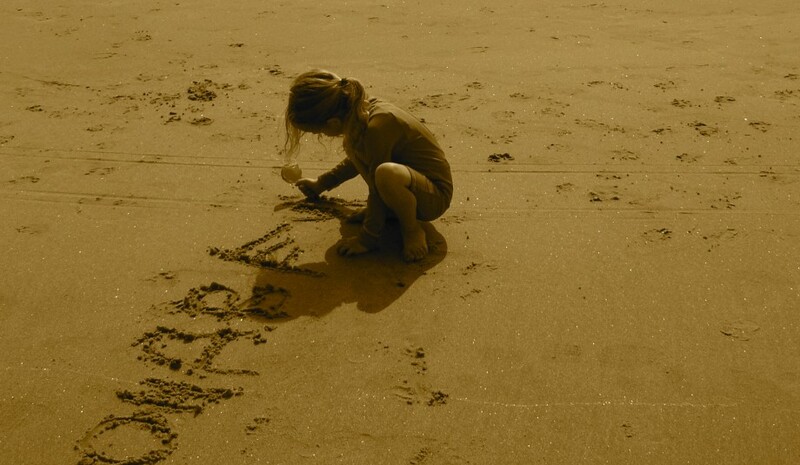 Road Trips With Kids: Don’t Forget the Mad-Libs! It doesn’t hurt to learn a little something without even realizing it! We are on our cross-country road trip from California to New York, and even though we just got to within 3 hours of our destination, we can’t make it due to running smack into the big snow storm pounding out here (they call ’em “nor’easters”). But, we are all faring well and at least we aren’t crawling and sliding down the highway any longer! 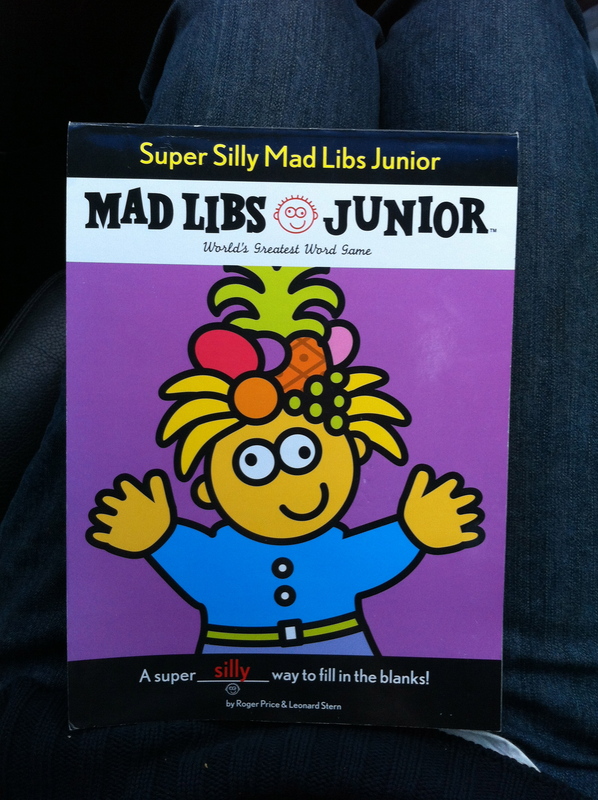 To keep things flowing for kids stuck in the car on a long road trip, I highly recommend bringing a goody-grab-bag and a pad of mad-libs! 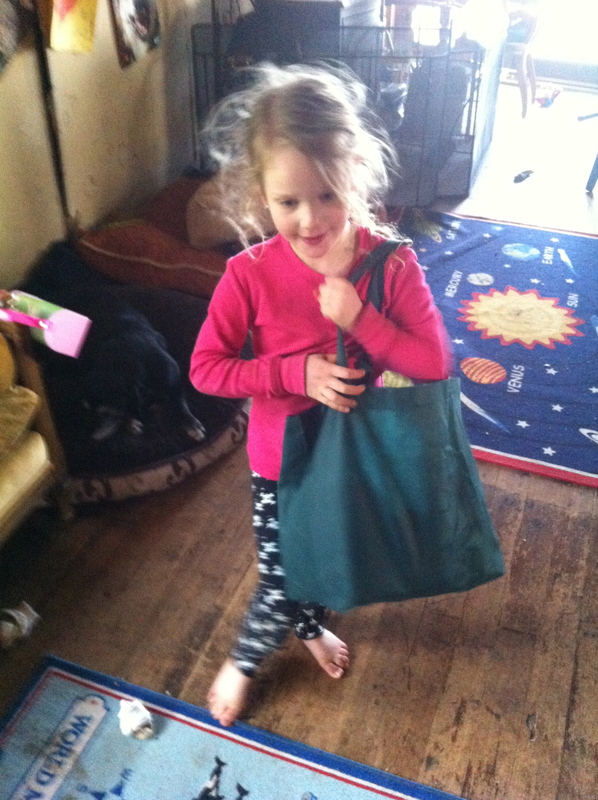 For the goody bag, I packed a draw-string cloth bag with an assortment of fun things that, when Captain gets restless, or is looking for something to do, she can reach in and grab a prize. I included stickers, an aboriginal-color-your-own-bracelet, a flashing owl, a pair of Melissa and Doug binoculars, a United States coloring book, a small orange padlock & key, and wooden beads for stringing. I also threw in a little travel container with a special prize to honor the upcoming Chinese new year: a little collection of Chinese-facts plastic coins. Fun! One of the best things to rally the troops after a long day on the road is the classic mad-lib. Captain now knows what nouns, adjectives, and verbs are because of these fun stories. 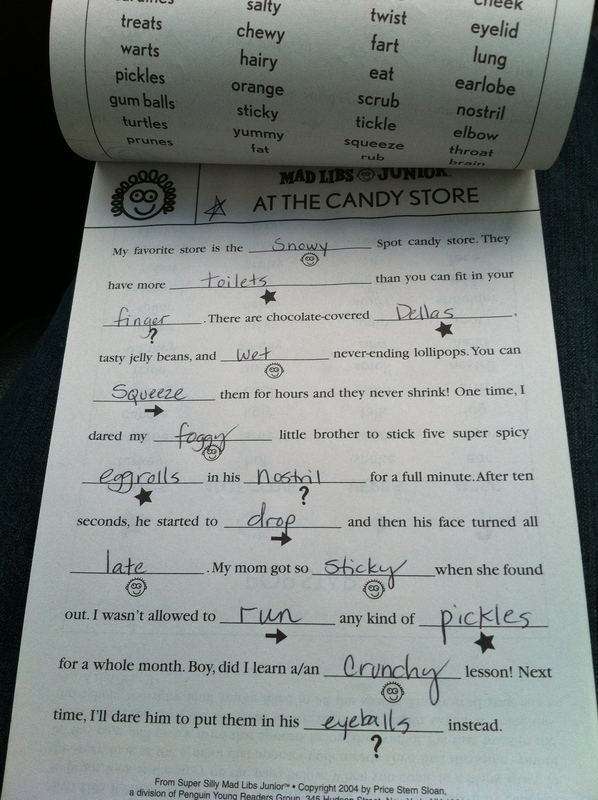 If you aren’t familiar with mad-libs, it is a pad of little fun stories in which certain words are left out. We all take turns with the cues to add words and then I read the story at the end. They are hilarious and really fun! It is pretty cool to hear Captain explain to her dad that adjectives are “describing words” and verbs are “action words”. They are great! We have used them for trips before and this time I tried the “Junior” version, but we really like the originals better. In the junior pad, they give you a list of words to choose from to make it easier for the younger crowd. But, we found that we like to pick our own words and will stick with the classics in the future. So here we are, hotel-bound until tomorrow afternoon when the storm calms and the roads are plowed. The adventure continues! I am just glad I have things to keep us all happy. 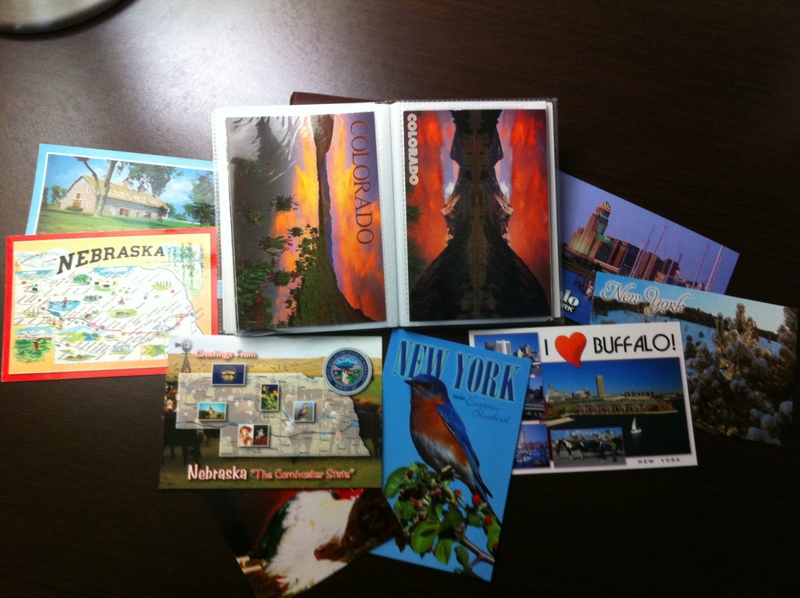 Well, I am off to help finish coloring the state of Iowa. Did you know that the state flower is the wild rose and the bird is the goldfinch? I am learning so much and I’m thankful that it never ends!! !